Our passion in finding a solution paid off. Now its your turn to enjoy the fruits of our labor for true wellness. Here are the secrets in a few words why our protocol is so powerful. – toxic synergy and pathogenic synergy are targeted with professional strength ingredients. When I listened to our professors, some 30 years ago, talking about infectious diseases or microbes, biofilms were never mentioned. The old school was fixated with the images and concept of free-floating (planktonic) bacteria infecting organs. Stealth infections, hiding in biofilm communities, were never mentioned. While homogeneous planktonic populations were studied in sterile labs, the heterogeneous (mixed bacteria, virus, fungus) biofilms represent reality in our body. It is interesting that the publications which discuss biofilm rarely if ever mention EDTA or flavonoids, while the publications which discuss EDTA chelation rarely if ever mention biofilm. I assume that this reflects the fact that different communities of researchers are involved in a narrow field and researchers don’t communicate with each other very well. My interest in seeing the big picture served me well in combining knowledge from various areas of research together with clinical feed-back, to form the basics of innovative approaches. Take StemDetox for two months. Switch over to Anti-Biofilm afterwards. Add ToxDetox when the 1st bottle of StemDetox is finished. Take ToxDetox every second night. Keep taking StemDetox or Anti-Biofilm every day. Take StopReabsorb/Charcoal every nights from day one. Always consult with your health care provider who knows your medical history, special needs and circumstances. Biofilms can vary in thickness from a mono cell layer to 3 inch/7 cm thick layer but mostly on average are 100 micron or micrometer (=0.01 cm) thick. Chemical analysis shows that the EPS matrix is mostly comprised of neutral and acidic sugars, e.g. glucose, mannose, galactose, rhamnose, ribose, fucose, uronic and gluconic acids, etc. Biofilm is often beneficial in nature. Biofilm, also called slime, in the flow boundary skin layer of rapid swimmers (e.g. barracuda) can effectively subdue turbulence and thus prevent energy loss. Huge surfaces of slime are also used in certain sewage treatment plants to clean up water. ‘A had Lyme for over twenty years and finally I see profound changes. First I took antibiotics and later I tried so many things without experiencing much improvement. Chronically ill patients with neurodegenerative, neurobehavioural and psychiatric diseases e.g. Lyme disease, Autism, Alzheimer’s, dementia, Chronic Fatigue, Gulf War Syndrome, Fibromyalgia (mainly caused by chronic mercury poisoning), and autoimmune diseases, commonly have systemic and central nervous system bacterial and viral infections that could play a major role in disease inception, increasing the types/severities of signs and symptoms, and overall progression of the disease. Evidence of Borrelia burgdorferi (Lyme disease), Mycoplasma species, Chlamydia pneumoniae, human herpesvirus-1, -6 and -7 and other bacterial (Ehrlichia/Anaplasma, Babesia, Coxiella, Bartonella) and viral (Herpes Simplex, TBA-virus) infections revealed high infection rates in the patients affected by the above listed illnesses that were less likely or not found at all in controls. all (!) implant related infections. All of these diseases are caused or partially caused by pathogenic biofilms. Indeed, a thoughtful review of these conditions confirms that accelerated aging is likely linked to the ability of the body to fight pathogenic biofilms. After all we shouldn’t be surprised that extra oxygen, EDTA, fasting, and resveratrol are suggested for antiaging – and all of them disrupt biofilms. In a breakthrough study, published in Nature Medicine in 2009, it was documented that even viruses alone are able to form biofilms. Consequently, the targeting of the biofilm communities, with the concurrent elimination of diseases causing microbes, emerges as one of the most important step in providing the highest level of care for patients suffering from neurodegenerative diseases, and in fact most chronic diseases. My hypothesis is that whenever the causes of chronic diseases are ‘controversial’ or ‘unknown’ or ‘potentially have environmental factors’ that produce the symptoms of the disease, one should strongly suspect the bioaccumulation of (1) toxins, (2) chronic biofilm infections, and (3) nutritional imbalances. F) Persistent infection and inflammation is maintained by the biofilm communities that are extremely difficult to eradicate by host defense mechanisms even in individuals with healthy innate and adaptive immune reactions and the body needs outside help. In most cases, acute Lyme disease (Borrelia burgdorferi) infections, characterized by planktonic (free-floating) cells, can be treated with antibiotics, although the spirochetes are triggered by the same antibiotics to form quickly the biofilm communities and/or pushing the bacteria into a dormant state. Spirochetes have a particular affinity for the nervous system. Many Lyme patients find lingering symptoms after antibiotic therapy due to the presence of biofilm communities. For others, Lyme remains dormant in their protected biofilm communities for months or even years and could come back forcefully due to weakened immune system, the bio-accumulation of toxins when it reaches a ‘tipping point’, elevated levels of EMF (Electromagnetic Field radiation, coming from cell phones or base stations) or superinfections. Some Lyme-specialist doctors claim that the majority of people are infected by Lyme and they are ‘carriers’, without clinical manifestations. When Lyme bacteria changes from a dormant to an active state they can resume reproduction and effectively re-seed the body from the Lyme-biofilms. Late-stage Lyme infection can result in a wide variety of physical, emotional, and mental or cognitive symptoms. The morphologic diversity of Borrelia within biofilms (cyst, granular, L form, spiral forms, etc. ), together with a variety of concurrent co-infections, makes it almost impossible for the body to eliminate the microbes on its own, lengthening the suffering and anguish of Lyme patients. The different forms of Borellia allow it to evade antibiotics, escape the immune system, and hide from detection by blood tests. I have great news to these patients, – but more about it later. Since the extracellular polymeric substance (EPS) attracts toxic metals, chronic Lyme patients benefit from EDTA chelation both due to its biofilm dispersing and toxic metal grabbing characteristics. A downward spiral often develops when the toxins, especially toxic metals, weaken the immune system and strengthen the outer layers of biofilm communities at the same time, maintaining the activity of Lyme, together with its co-infections. Lyme disease complexes with its biofilm co-infections (bacteria, virus, fungus, and parasites) are rarely resolved by the host’s immune system. Consequently, pregnant women can pass the Lyme bacteria through the placenta to the fetus in the womb (congenital transmission). This bacterial transmission, combined with the dumping of the toxic metals, can lead to Autism, often when further mercury floods the body with childhood inoculation or when the same series of inoculation severely compromise the immune system of the child that allows the Lyme bacteria to come forwards from the hidden biofilms and flourish, leading to the diagnose of ‘Autism’ or in milder cases ADD or ADHD. A thought provoking book makes the connection between Lyme disease and Autism and lifts the veil from the chronic nature of Lyme disease and infectious cause of Autism. I have a particular interest in Alzheimer’s as my father died in Alzheimer’s. The number of Alzheimer’s (AD) patients continually skyrocket since the turn of the century. Cognitive dementia currently affects about 10% of those over 65, and as many as 50% of those over 85 years of age. Autopsies reveal in the US that the vast majority over 65 already have brain plaques linked to progressive dementia, even if their brain function is totally normal since the process starts years or decades before full-fledged memory loss and dementia is noticed. It also means that protective measures should be implemented decades earlier. While many factors contribute to Alzheimer’s, chronic infections and environmental pollution emerge as the key decisive factors. Dr. Thomas Nissen, an expert in Environmental Medicine, claimed that detoxifying the body of toxic metals has the highest priority over any other intervention for helping people with progressive cognitive impairment. There is evidence for four factors in the development of Alzheimer’s, viral, bacterial, toxic, and to a lesser degree fungal. Evidence for a major causative role of a common virus, herpes simplex virus type 1 (HSV1 or oral herpes) was first published in 2008 in the Journal of Alzheimer’s Disease. Other neurovirulent viruses are also implicated as co-infection such as herpes virus type 6, Epstein-Barr and cytomegalovirus. Chronic fatigue is often a clinical sign for the presence of viruses. A considerable body of evidence suggests that heavy metal, especially mercury and lead, furthermore aluminum and other metals, contribute to the etiology of neurodegenerative diseases, including Alzheimer’s. Toxic metals have a documented neurotoxicological effect as they interfere with a multitude of intracellular targets resulting in oxidative stress (leads to depleted Glutathione levels), mitochondrial dysfunction, deregulation of protein turnover, and brain inflammation. Fetal exposure to heavy metals early in development can lead to neurodegenerative disease later in life (ADD, ADHD, Autism, Alzheimer’s). Non-cytotoxic levels of mercury and lead accumulate in the brain cells with delayed toxic effects. The expression of amyloid precursor protein was increased by both lead and mercury while mercury alone stimulated the formation of insoluble ?-amyloid, a hallmark of Alzheimer’s disease. Fungal cells live inside the neurons, explaining the hitherto elusive detection of fungal infections in the brain of Alzheimer’s patients, according to a recent study published in the Journal of Alzheimer’s Disease (August, 2014). The very first evidence was reported recently that high levels of fungal polysaccharides were detected in peripheral blood, reflecting fungal infection in AD patients (July, 2014). Anti-fungals (EDTA, oil of oregano) should be incorporated into smart strategies against Alzheimer’s. I list here some of the most promising biofilm-busting approaches that could open up the biofilms and lead to the elimination of the hidden microbes. Enzymes play a very important role in the healthy maintenance of the body. Fifty percent of all enzymes in the body are metallo-enzymes where a beneficial metal, e.g. zinc or selenium, is needed for the correct and effective functioning of the particular enzyme. Due to elevated toxic levels in the body, including toxic heavy metals, the metal component of these metallo-enzymes are replaced over time by toxic metals (mercury, lead, cadmium, etc. ), rendering them ineffective or non-functioning. The electromagnetic (EMF) radiation keeps the bond between the toxic metal and protein enzyme complex much stronger, hindering any detoxification efforts. Enzymes, especially proteolytic enzymes (found also in StemDetox and Prevent.Pro), are able to disrupt the outer layers of biofilms and uncover hidden microbes. The well-studied dental plaque is a natural biofilm that is generally considered to be anaerobic, yet, allows for microbial population diversity of aerobes, anaerobes and microaerophiles. Overall, studies confirm that oxidative agents offer possibilities for reducing the pathogenic activities of biofilms. potentially could directly kill the Lyme spirochete due to the high level of oxygen free radicals. If we recognize the need for over a 100 HBO treatments needed for a Lyme patient, time, financial and practical aspects favor the drinking of the one-of-a-kind, oxygen supercharged Kaqun water instead, the currently available water with the highest (stable) oxygen clusters. There were ten clinical studies done with Kaqun water to confirm its unique anticancer properties. As we know, the Nobel Laureate Dr. Otto Wartburg claimed that all cancer cells are anaerobic, they lack oxygen. And Kaqun water, with its highly stable oxygen clusters (one could pour water into a glass and the oxygen would still stay inside), can deliver oxygen to cancer cells and normal cells like no other water. Biofilm is also anaerobic and the extra oxygen disrupts the microbial colony within the biofilm. I wonder what the links are between pathogenic biofilm communities and cancer cells, especially, since our understanding is growing that many type of cancers are triggered or maintained by infective agents. Furthermore, cancer can spread (metastasis) and the parallel is striking again with biofilms (primary and secondary-metastatic biofilm infections). If you are concerned about cancer, think about what Kaqun water, Flavin7 Gold, ToxDetox, daily teaspoons of Baking Soda (more about it further down), and daily 10,000 IU vitamin D3 could do in synergy. I can’t give you a protocol, but there is a reason why I mention these stellar five together! While individually they shine brightly on their own, it’s all about the tremendous power of synergy that can give more than just hope. It’s important to share here the clinical study where those who drunk Kaqun water daily (one liter or 1.5 liter) over three weeks achieved a market improvement in brain functions, compared to the control group. Likely, Kaqun water could benefit those who are looking for a new way to manage dementia and Alzheimer’s, beyond those who drink it for enhanced sport performance, stamina, enhanced executive decision making (CEOs or students before exams), long distance drivers, anti-aging or cancer. The food we eat has toxic metals in it and the vaccines have mercury and aluminum that make the blood-brain barrier more penetrable. Today in the USA 69 doses of 16 vaccines by age 18, with 49 doses of 14 vaccines are given between the day of birth and age six. The combination of weakened immune system and the extra toxins entering the body create an environment in the body when the microbes feel more at home. EDTA’s dual metal removing and antibiofilm effects elevates it a prominent role in our quest to successfully turning around conditions where many approaches often fail. EDTA chelation has great biofilm dispersing qualities as it attracts the cations including toxic metal cations, based on EDTA’s affinity list, and weakens the structure of the biofilm EPS to the point when the immune system (antibodies) or antibiotics have again access to the microbes hiding within the biofilm communities. iron+++, mercury++, copper++, aluminum++, nickel++, lead++, cobalt++, iron++, etc. The strong pulling and removing effect of CaEDTA on iron might explain its strong biofilm disrupting effect. Iron, Calcium and Magnesium can feed the biofilm by supplying it with some of the raw ingredients it needs to build-up its protective polysaccharide matrix barrier or increase biofilm density. Consequently, try to avoid taking especially extra Iron, but also to a lesser extent Magnesium and Calcium, when targeting pathogenic biofilms. Note that EDTA stays only in the blood and is not being picked up by the tissues and cells. This explains its short half-life. The one-of-a-kind ToxDetox emerged as the best EDTA product anywhere. The synergy between EDTA and Glutathione (Glutathione enters the cells) creates a dynamic and safer environment both for the elimination of all toxins (beyond toxic heavy metals) and not surprisingly, yields a three times higher toxic elimination, compared to EDTA alone or Glutathione alone. Another exciting, yet practically unknown aspect of EDTA is that it is able to supercharge antibiotics by 1000 times. Plus, EDTA can sensitize the outer layer of antibiotic resistant microbes when antibiotics become effective again. Sometimes I wonder why hospitals let their patients die in the intensive care unit from antibiotic resistant superbugs while the EDTA is sitting at the Emergency Entrance waiting for the next patient who has acute lead poisoning. Hospitals let their patients die even though the solution could be found within the walls of every hospital. Likely one of the most exciting aspects of flavonoids are their very powerful anti-vital effects. While not many practitioners know yet, but viral infection is at the heart of Lyme disease and our Flavin7 Gold is at the center of our one-of-a-kind protocol. Be honest. How much did you hear about the flavonoids’ effect on Quorum sensing? Years ago when I helped a major European ‘liquid flavonoid producing company’ to enter the North American market, I learned more about flavonoids. The benefits of flavonoids in anticancer, antioxidant, anti-inflammatory, cardiovascular diseases and other health benefits are well established. However, their role in disrupting pathogenic biofilms is practically unknown. But I’m convinced that this is one of the reasons why flavonoids are so powerful. Autoinducers, small signaling molecules, are secreted by bacterial cells that initiate a signaling cascade within the bacteria community in the biofilm in a concentration-dependent fashion. Activation of signaling cascade results in simultaneous regulation of several genes across the microbial population within the biofilm community. This phenomenon is called quorum sensing and plays a very important role in the expressed virulence and biofilm formation of microbial cells. Flavonoids have the capabilities to suppress the formation of biofilms and can express a non-specific quorum sensing inhibition. Resveratrol is produced naturally by several plants when under attack by bacterial or fungal pathogens. In a study resveratrol demonstrated significant antimicrobial properties on periodontal pathogens (killed all studied microbes within 24 hrs). The flavonoid phloretin inhibited the biofilm formation of highly pathogen enterohemorrhagic Escherichia coli O157:H7 as well as expressed an anti-inflammatory effect in inflammatory bowel diseases without harming beneficial commensal E. coli biofilms – an amazingly selective effect. A new study suggests (www.nature.com, October 26, 2014), as other studies have done with various flavonoids, that naturally occurring flavanols in cocoa may reverse memory decline as much as 20 or 30 years. This study, as most studies, lacks explanation about the reasons why and how flavonoids exert their beneficial effects. Yet, their quorum sensing inhibition might give us a clue for their action. The flavonoids in both StemDetox and Prevent.Pro play an important role in their unique and very broad actions. But I suggest a bio-organic liquid flavonoid product that is likely the best flavonoid to be used against biofilms: Flavin7 Gold. I’m convinced that flavonoids represent a so far totally neglected, yet exciting new tool at hand to combat pathogenic biofilms as our understanding grows of these colorful gifts of nature. Charcoal is mild, compared to other anti-biofilm ingredients, however, can play a crucial role in the gut. Charcoal is not being absorbed from the gut. Charcoal weakens the biofilm communities in the gut, attracts and keeps toxins for elimination and speeds up the healing of leaky gut. A healthy gut maintains healthy gut biofilm communities that support the absorption of nutrients. This thin, healthy mucus layer, covering the lining of the gut, is not affected adversely by the charcoal. Regular charcoal usage has amazing effects that is totally hidden even from the alternative medical communities. A study reported the life-extending effects (by 40%) of charcoal in laboratory rats. For skin cancer, mix 1/3 charcoal powder with 2/3 curcumin with a bit of water to create a paste and cover the area. The paste should be moist but not dippy. Place the paste to the affected area and cover it first with a paper towel and then with a plastic to keep it from drying out. Plastic food wrap is fine. Once the charcoal dries out it loses its effectiveness as it has to be able to absorb. Change this charcoal bandage every 4 to 6 hours. For overnight use for keeping the charcoal moisture longer, add (1 tablespoon) ground flaxseed powder or starch to (1 tablespoon) charcoal powder (or open 10 capsules from our StopReabsorb/Charcoal) and mix these with a half cup of water. You could add to this mix a ¼ tablespoon baking soda (sodium bicarbonate). You could use these charcoal or charcoal/curcumin/baking soda bandages for most skin conditions such as sunburn, insect bites, any skin infection or inflammation including poison ivy, or even above inflamed lymph nodes (e.g. in breast cancer). Always look for charcoal in capsules that you could open to prepare a poultice or paste if needed, never buy tablets where 30% of it is glue that keeps the tablets together. We can observe that animals, including our pets, fight an infection by not eating or moving for a period of time and staying in a quiet corner. They fast to be healed. All major religions promote fasting. And while the spiritual aspects are emphasized, medical research is catching up about the tremendous and very wide ranging effects of intermittent fasting from normalized hormone levels to anti-aging and from fighting infections to gaining mental clarity. In fasting the nutrient levels drop in the blood that disrupts biofilms as the hidden microbes starve and open up the outer layer of the biofilm from within to have greater access to nutrients in the blood. This happens when the immune system is stronger due to less microbes reaching the blood, picked up from the gut together with the nutrient uptake. Intermittent fasting is ideal in combatting biofilms as it creates an on-off effect for the microbes to receive nutrients intermittently and challenges the microbes to their limits. Most homes have baking soda in the kitchen or kept for cleaning. But not many people know that baking soda is one of the least expensive and very safe health tools around. While baking soda’s pH optimizing effects are touted as the likely mechanism of action, I’m increasingly convinced that its antibiofilm activity is one of the important, or the most important, reason for its wide ranging benefits. Use one to two teaspoons of baking soda (or pure bicarbonate powder) in an eight ounce glass of pure water, with some lemon or lime juice to add flavor, twice daily between meals. While acute Lyme infection might be cured if treated very early, the effectiveness of antibiotics and specialty herbs are questionable for chronic Lyme or Alzheimer’s patients. Once this failure is acknowledged, new approaches are explored that could lead to the type of breakthrough we share here. BioInfraLight, a new bioresonance device, promises to represent a novel approach in the ‘management’ of chronic Lyme, its co-infections and other related conditions such as Alzheimer’s, and many other microbe related chronic conditions. It has been shown that everything in the universe has its own unique frequency. A bioresonance device transmits electromagnetically the type of frequencies that has specific biological effects. Anti-Biofilm Protocol Whenever chronic, neurodegenerative, stealth infections adversely affect the body and eventually the brain, they manifest differently in the different points in the person’s life. It they effect fetal development, the individual might develop Autism, later in mid-life we may see depression, Chronic Fatigue, Lyme Disease or cognitive impairments, while even later in life we might diagnose dementia or Alzheimer’s. Stealth infection means that the microbes (bacteria or even viruses) are not seen by the immune system as they hide behind biofilms. These infective agents include Borrellia, Mycoplasma, Bartonella, Babesia, Rickettsia, Anaplasma, etc. In all of these cases what they have in common is the switching on the inflammatory cascade as they provoke the immune system. The process is fueled by stealth microbes, typically hiding behind biofilms, and the elevated toxins, both environmental and microbial, exacerbating the whole process. It is acknowledged that all of these conditions are complex, changing over time and there is an individual variation that requires the guidance of a health care professional who is familiar with the medical history of the individual. Even though there has been a great interest in biofilms, effective treatments are still limited. Until research catches up, the treatment of these conditions cannot be anything but subjective, open to questions, individualized, often complex and long-lasting with ups and downs. Mediterranean diet is preferred with organic food, intermittent exercise and intermittent fasting. Take your multi, omega 3, B vitamins, and vitamin D.
Consider taking StemDetox for two months and at that time switch over to Prevent.Pro. 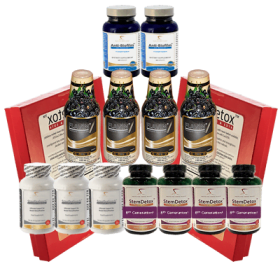 When you finish with the first month of StemDetox, introduce ToxDetox (Glutathione and EDTA synergy) chelation suppositories as you still take StemDetox, – you would take them at the same time now. Take ToxDetox every second night for minimum two months, depending on age, medical history, toxic exposure and your chronic challenges. Once finished, you might want to switch to Glutathione1.5 if you continue with the program (or if you are challenged by viruses. Google: “Glutathione and Ebola” to learn more). Keep taking Anti-Biofilm every day, after you run out StemDetox. Take 1gram (4 capsules) StopReabsorb/Charcoal daily from day one. Daily charcoal increased laboratory rats’ healthy life-span by an extra 40%. Daily charcoal is the best kept secret for good health and longevity and it’s not interfering with nutrient uptake (otherwise, the rats couldn’t have a 40% longer healthy life). There is no evidence or study showing that charcoal robs the body from nutrients. Drink your two teaspoons of baking soda (or pure bicarbonate powder) in a glass of water, with some lemon or lime juice to add flavor, twice daily between meals. Drink a bottle (1.5 liter) of Kaqun water every day. Drink also 10ml (5ml in the morning and 5ml in the afternoon) Flavin7 Gold daily. There is 200ml in a bottle. Try your “intermittent fasting” on Saturdays. Don’t forget that you fast every night – just extend this nightly fast. Consciously make the decision that as you fast, you will express extra care towards your surroundings, also to fight any grumpiness you might feel. Use your gained mental clarity and openness to deeper spirituality for loving more and praying more. Enjoy your fast! (You will also loose some weight as an extra bonus.) Have your morning 5ml Flavin7 Gold with a few cups of (organic) green tea instead of breakfast. Eat for lunch sauerkraut (full with prebiotic, probiotic and healthy bulk) and maybe an apple and more green tea. Take your multi with your Omega 3 and Vitamin D3, as usual. The ‘success’ of this powerful protocol is mainly dependent on your ability and willingness to go through the steps and persevere. There is nothing more liberating than changing around your life for the better. Specific dietary restrictions and additions, furthermore, rebuilding and regeneration are as important as eliminating the biofilm. These should be determined on a case by case basis, in consultation with your health care provider who knows your medical history, special needs and circumstance. Disclaimer: This communication does not provide medical advice, diagnosis or treatment. Always change your drugs, supplements, nutritional habit and lifestyle choices under the care of your doctor. Views expressed here do not necessarily reflect those of Oradix.com or its partners and staff. The information, including but not limited to, text, videos, graphics, images and other material contained in this communication are for informational purposes only. The purpose of this message is to promote broad consumer understanding and knowledge of various health topics. It is not intended to be a substitute for professional medical advice, diagnosis or treatment. Always seek the advice of your physician or other qualified health care provider with any questions you may have regarding a medical condition or treatment and before undertaking a new health care regimen, and never disregard professional medical advice or delay in seeking it because of something you have read in this message or in materials or websites referred to herein. Do not delay or disregard health related advice from your licenced medical professional over any information shared here. The use of any information provided here is solely at your own risk. 3. “Research on microbial biofilms (PA-03-047)”. NIH, National Heart, Lung, and Blood Institute. 2002-12-20. 17. Effect of enterosorption on animal lifespan. Frolkis VV, et al. Biomater Artif Cells Artif Organs, 1989; 17(3):341-51. Institute of Gerontology, AMS USSR. This entry was posted in Protocols and tagged Alzheimer's, anti-biofilm, autism, Lyme.